It makes nice change to be able to provide a service to a new ecology company looking to serve and protect the natural environment when the cloud of progress and development looms strong. There is a whole raft of legislation, designed solely to protect native British Wildlife, that businesses, organisations and private individuals need specialised help and advice to deal with and ensure they comply with the law. Fauna Forest Ecology specialise in providing a range of compliant services developed to ensure both sides of the fence get the best treatment available. 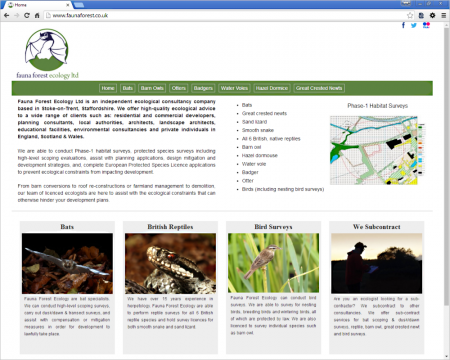 If you have a bat, bird, reptile or amphibian question, Dave is the man to ask.